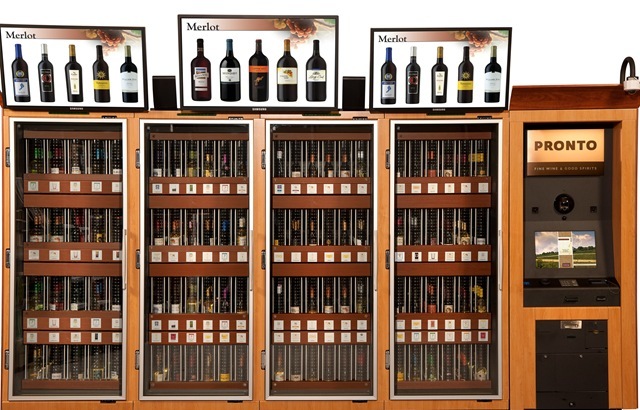 Pennsylvania’s Liquor Control Board has installed experimental vending machines in a Wegmans store in Mechanicsburg and a Giant in Harrisburg, and could approve nearly 100 more this year. filling trunks at loading docks in Jersey and D.C. Thus the machines, which the LCB calls kiosks, are a consumer-friendly surprise, even shock. International varietals dominate the 52 selections. Brands include Blackstone, Mouton Cadet, Clos Du Bois, Ravenswood, Campo Viejo, Ménage à Trois, Barefoot, Ruffino, J. Lohr, Francis Coppola, Concha y Toro, Kendall-Jackson, Santa Margherita, Robert Mondavi, Cavit, Nobilo, Gnarly Head, Sutter Home, Woodbridge and Yellowtail. Unlike the hair-tearing lunacy of LCB stores, whose operating hours seem to be all different all the time, the machines are consistent: 9AM-9PM Mon.-Sat., and some may eventually operate Sundays, too. Saints preserve us. Problem? A HELP button connects you, live, to sentient carbon-based lifeforms—actual human beings. Say the breathalyzer bounces you: LCB Press Secretary Stacy Witalec says a state employee might then ask whether you’ve just rinsed with Listerine. If so, he’ll suggest trying again in 20 or 30 minutes. Turn-downs can easily occur because of the zero-tolerance .02 standard (PA’s DUI standard is .08). Jeez Louise! You could hit .02 after one beer, glass of wine or shot of whiskey. Or passing within a hundred yards of Lindsay Lohan. 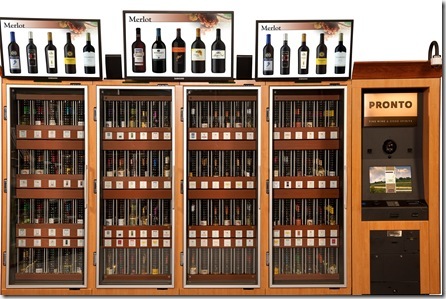 Vending machines could also sell canned wine, were there enough to sell. In 1999 Francis Coppola introduced a sparkler named for his daughter Sofia, first in standard bottles, later in splits (straws attached), for casual sipping. Pommery Pop, Perrier-Jouët, Korbel, Piper-Heidsieck, Nicolas Feuillatte and others offered splits too, but in wee bottles. Sofia’s splits were actually in cans, which added a nice dose of publicity and shock value while expanding sales opportunities to poolside parties and other no-glass zones. Still, consumers haven’t fallen like lodgepole pines for cans. Which are hardly new: Allan Green, owner-winemaker of Mendocino County’s Greenwood Ridge Vineyards, has collected hundreds of them. Some (e.g. those for the recent Aussie Wines brand) are new. One oldie recalls the Cold Duck Era or Dark Ages of American wine-drinking. Especially notable are the cone-top cans for Mother Goldstein’s ‘sacra-mental [kosher] wine,’ a Prohibition favorite. You doubted my word on canned Cold Duck? 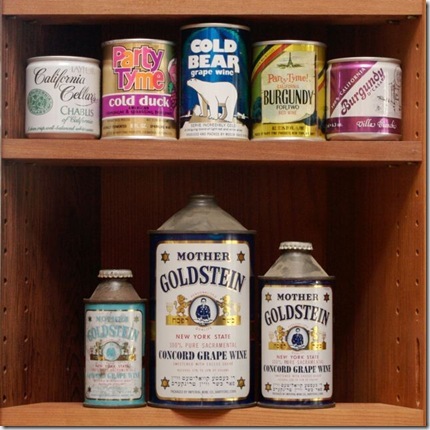 On Mother Goldstein’s, too? This photographic proof comes courtesy of Greenwood Ridge’s Al- lan Green, who is a prince. A prince, I tell you. The French Army of World War I was an entrenched can fan, so to speak. (As for World War II, I’m not sure. 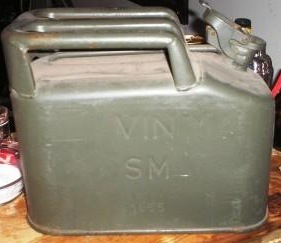 Did the French fight in that war?) Its poilus or G.I. 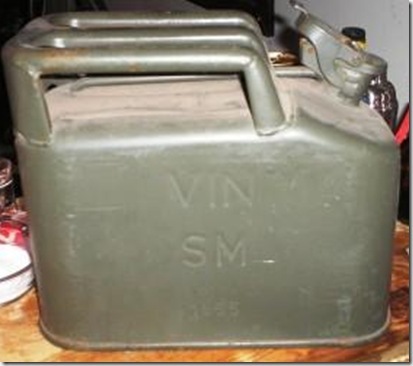 Joes received rations of canned wine, rough-and-ready red (pinard) and white (vin blanc). They’re still with us, in a way: I’m told that British Tommies who were lubricated by generous French pals combined the words, and maybe even the wines, resulting in plonk. (It wouldn’t have been the first time for outre blends: Queen Victoria dosed her claret with malt whiskey.) At least the cans meant that no plonk was ever refused for being corked. Never mind wine. Mark Kirkland, president of Mark One Foods in Salt Lake City, is pushing his sandwich-in-a-can idea—the Candwich. His main problem is that he can’t catch a break. 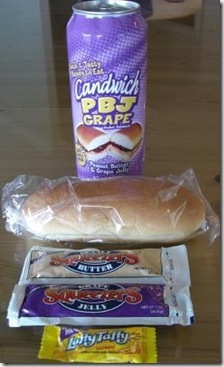 Does anyone acknowledge that his canned PB&Js offer both traditional grape and far-out strawberry? 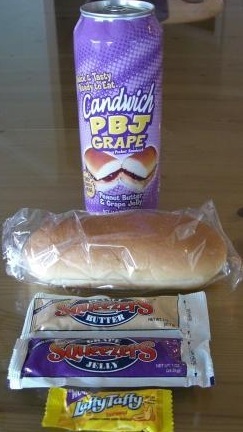 Give his BBQ Chicken Candwich a respectful nod? Applaud their shelf life, which he calls ‘excellent’? No sir. About the only ink he’s got thus far connects him unfortunately and innocently with an accused scam artist name of Travis L. Wright. Wright’s wrong was to take $145 million from 175 or so investors and sink it not into real estate for a promised 24% return but in internet wristwatch sales, rose-petal greeting cards and—the Candwich. The deals seemed unduly fragrant, and in July the SEC, awakened from its dream of peace (i.e., decades of Rip Van Winkling past Bernie Madoff), filed a complaint. You can see their thinking, no? “Wright stole $145 million and owns a stuffed wildebeest. Madoff stole $68 billion but is our friend. GET WRIGHT!” Clearly the SEC has priorities. machine and buy yourself a bottle or two of the Lumberyard Chardonnay, which has so much wood in it you could use it to kill vampires.